We're not talking about (traders) throwing crazy amounts of money in. Most of it is risk capital. A lot are testing the water: Are we for real? I understand that. It's a 15-month-old business. People are not going to have the level of trust that they have with a company they've known for years. 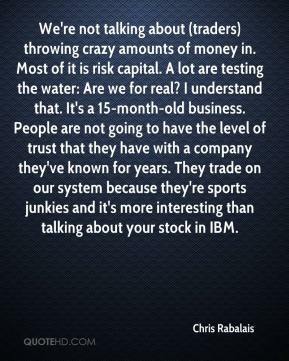 They trade on our system because they're sports junkies and it's more interesting than talking about your stock in IBM. AllSportsMarket.com is dedicated to increasing the exposure and popularity of a variety of sports across the globe through its international derivative-based sports financial exchange. 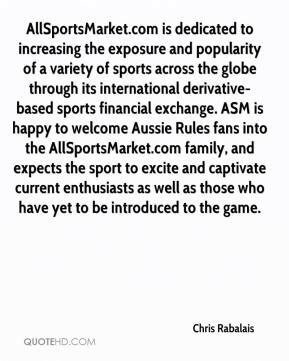 ASM is happy to welcome Aussie Rules fans into the AllSportsMarket.com family, and expects the sport to excite and captivate current enthusiasts as well as those who have yet to be introduced to the game.